In this video I’m using a Martin D-35 acoustic guitar with an LR Baggs Anthem pickup, and a Shure beta58 microphone. 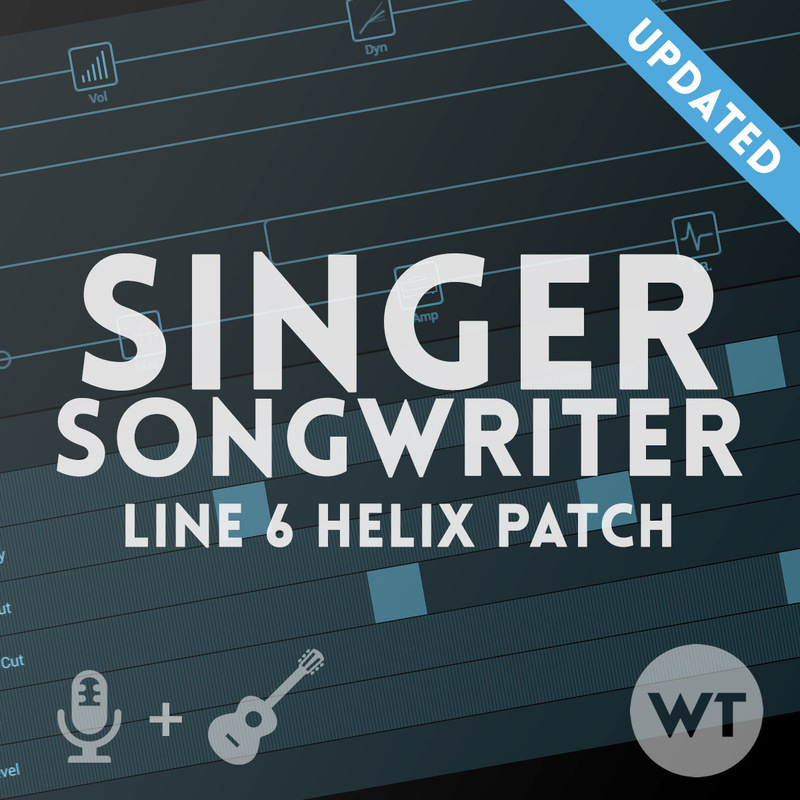 IMPORTANT: Because this patch uses effects models that were not included with the initial release of the Helix, it is very important that you upgrade the firmware on your Helix and the HX Edit software from Line 6 to the latest before installing this patch. Even if your Helix is up to date, the ‘HX Edit’ app needs to be updated as well. This patch is designed specifically for musicians who play acoustic guitar and sing. It will process both acoustic guitar and vocals (via a microphone) separately. It uses the regular guitar input for acoustic guitar and the mic input for vocals (we assume you’ll be using some kind of dynamic mic like a Shure SM58). The Helix LT does not have the microphone input, so to use this patch with the LT, you’ll need a separate microphone preamp to make it work – something like the Art Tube MP would work perfectly and is very affordable. Using higher end preamps will yield better results. You get a basic set of effects that are useful for acoustic including delays and reverbs. There is also a looper and a Swells button to create huge lush volume swells. See the signal chain below for more details. EQ: There are two EQ’s for vocals – one is designed to be always on and will give any vocal life. It adds high end and removes low end and muddy frequencies. This is a great starting point for nearly all vocals. Presence EQ: This EQ will add more high end in the frequencies which we usually associate with ‘presence’. If the vocal feels a bit dull, try turning this on. Intimate sound vocals: For more intimate sounding vocals (usually for a softer/slower song, or soft sections), use the Slap DLY and the Plate VRB. Bigger vocals: For bigger sections, try turning on the 1/8 DLY and the Big VRB – this gives you a much ‘wetter’ vocal sound. Dry: When speaking (not singing a song), turn all the delays and verbs off. The acoustic guitar is processed in the top row of effects. It uses the regular guitar input, and it outputs through the ¼ inch output. You must use the ¼ inch output for the acoustic chain, otherwise you won’t hear it. Cali Graphic EQ – this EQ is not on by default, but will add highs and upper midrange to your guitar tone. Experiment with turning this on/off for your guitar. Sinple EQ – not mapped to a switch and on by default. This is the main guitar EQ – it adds lows and highs, and removes lower midrange. LA Studio Comp – always on, not mapped to a switch. The vocal signal is processed in the bottom row of effects. It uses the microphone input, and it outputs through the XLR output. You must use the XLR output for the vocal chain, otherwise you won’t hear it. 10-band Graphic EQ – mapped to switch labeled “Presence” – play around with this EQ to see if you like what it adds. For female voices, it may be a bit too much high end, but works well for male and lower voices. This patch utilizes snapshots specifically for vocal effects. The intended use is to have the snapshots on the top row while leaving stompboxes on the bottom row – this will give you access to your acoustic guitar effects via stomps while controlling vocal effects via snapshots. To do this, go to ‘Global Settings’ and navigate to the ‘Footswitches’ section. Select ‘Snap/Stomp’ under the Preset Mode Switches option. Snapshot 1: Soft Vox: Adds the short delay and reverb options. Snapshot 2: Big Vox: Adds the bigger delay and verb options. Snapshot 4: Speaking: This turns all delay and reverb off for anytime you’re not playing a song and want to speak into the mic. Snapshots are probably the easiest way to use this patch. The main thing they accomplish is the ability to turn all the wet effects of the vocal chain off with the push of one button. Wasn’t happy with the 30 minutes I spent trying to get a good vocal and guitar mix as still have only had the helix a month or two. Totally glad I went ahead and bought this Saturday night, as it’s absolutely fantastic. Finally felt like I had solid vocal mix and the guitar was more subtle than I was originally doing, which was perfect. Well done, and thanks for this patch! Will be a staple for any acoustic/vocal session I do in the future.